Whether we ride to hounds, are advancing through the levels of dressage, practice the multiple disciplines of combined training, participate in jumping tournaments, or simply enjoy luxuriant commune with nature and a horse on varied trails, the training foundation for every equestrian discipline is stabilization. Because for all of these pursuits it is most desirable that the horse be calm, forward, and straight, we must first “stabilize” it. And once we have achieved the condition of stabilization, we are wise to frequently reinforce it, by spending a portion of all of our mounted time riding on loose reins, day after day… jubilantly … year after year. Webster, I can’t resist, also defines “stabilizer”: “a substance added to an explosive to prevent it from exploding spontaneously,” as for example, a rider astride a horse awakening to the first fresh air of a balmy spring day. (page 21)”Calmness combined with cooperation leads to the very valuable “stabilization” of the horse. A stabilized horse will maintain by himself, on loose reins, any pace at ordinary speed after it has been indicated by the rider. A stabilized horse can, on many occasions, be pleasantly ridden with complete nonchalance, and when at times the rider wishes to halt his horse or change the pace it can be done with the voice alone. (page 114)”Unconstraint is the psychological and physical state of the horse in which it flexes its muscles elastically only as much as is required for uniform locomotion under its own weight increased by that of the rider, thus avoiding all unnecessary expenditure of energy….Unconstraint is attained when the horse allows the rider to take his place in the saddle without tightening its back and begins its natural, well-timed trot without any action of the reins. The correct (i.e., springy, although still not pronounced enough) oscillation of all its body muscles is also apparent to the observer in the relaxed, satisfied expression on the horse’s face, its ears half erect, attentive only to the path and the rider, and the natural carriage of the tail, which swings from base to tip in time with the hind leg that happens to be grounded. As unconstrained and well-timed ground-covering strides are the basis of all equestrian work, it is obvious that these two interdependent prerequisites must exist before further gymnastic training can be undertaken. So how does one arrive at this blessed state of calm, even, rhythmic, regularity in all gaits, riding nonchalantly on loose reins, changing gaits with voice commands? “Schooling begins by teaching the colt voice commands and stabilization; these are the first lessons in cooperation. On this basis the further schooling program is being built up. In reclaiming upset horses (where there is a chance) stabilization works wonders. My preferred method of longeing, like Littauer’s, is very simple. I use a longeing cavesson, adjusted so that it lies above the most sensitive cartilage of the horse’s nose, not on it, making sure that the jowl strap acts as just that, not a throat latch, in order to prevent the cheek pieces from sliding or being pulled into the area of the horse’s eye. Attach to the center ring of the cavesson a longe tape of thirty feet in length or longer. I use a longe whip equal in length to my height, with a lash equal to that additional length. As with shoes, the fit of the equipment is everything! For those who fancy themselves riders, not horse trainers, let me reassure you that teaching a horse to longe on voice commands is easy, and rewarding. Not only will it soon increase the pleasure you derive from riding, or accelerate your progress toward your goals, if that is your perspective, but longeing will let you see the horse in motion a constant thirty feet away from you, providing a feast for the eyes (as “The outside of the horse is good for the inside of the man”) and a learning experience. The aids for longeing can be compared to those for riding. 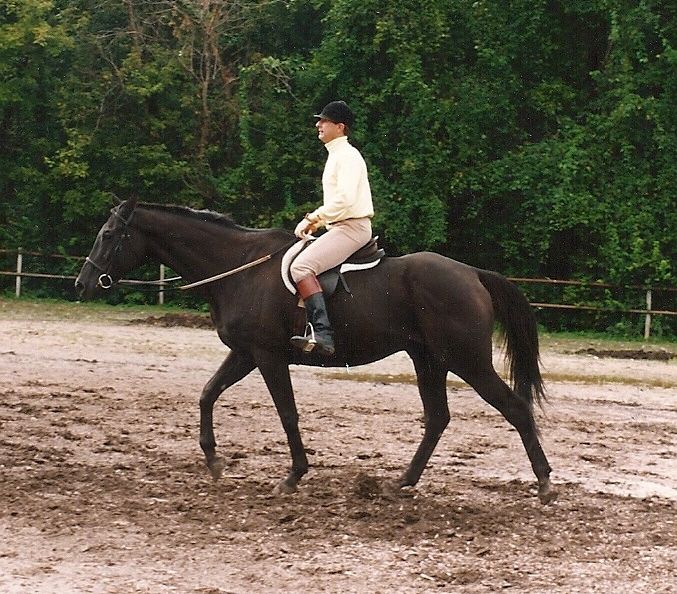 Position yourself with your shoulders parallel to the horse’s length, longe in the hand toward horse’s head, whip in hand toward tail; this position is your “seat.” The whip is your “leg,” pointing to the ground when the horse is at halt, and to its hock when it is moving at any gait. Wave the stock of the whip as you would squeeze with your calf to ask the horse to move forward, wave the lash to urge more strongly, and crack the lash when you would apply spurs, very seldom if at all, and only if the horse did not respond adequately to successively stronger urgings. The tape is sometimes called a longe “rein” (not to be confused with “long” rein), and the cavesson is equivalent to the bit. Your good hands will maintain a straight line from elbow to “bit”. Gently shaking the tape is the mildest admonishment to the horse–“Are you listening? Get ready” or “steady”. A somewhat more vigorous shake of the tape is all you need to signal the horse to come back from walk to halt-“whoa.” As compared to the rein in hand transmitting a message through a bit to the horse’s mouth, it takes longer for the message to get from the riders hand to the horse’s nose when transmitted through the thirty foot length of longe tape and cavesson. Be patient, it is acceptable for the horse to respond slowly. Flipping the tape so that the cavesson comes down hard on the bridge of the horse’s nose is a severe punishment, equivalent to a jab in the mouth with the bit, reserved for interrupting a high spirited bucking spree, for example. Using these “aids,” or “influences,” teach the horse voice commands. Take advantage of the corner of a paddock, ring or indoor hall to define the working area for the initial lessons to the horse. Say “walk,” then urge only as strongly with the whip as necessary to elicit the desired response. When the horse walks, reward with your voice-“good boy.” Let the horse walk long enough to reassure him that he is doing as you wish, then ask the horse to halt by saying “whoa,” followed by shaking the tape. With some horses, you may need to walk toward the horse’s head, to get it to halt, and “good boy.” In the first lessons you may play the tape out to only fifteen feet, but walk with the horse, inscribing with your own feet a circle of thirty feet or more, so that the horse is inscribing a circle of sixty feet or more. And circle both directions, i.e. to left and to right. After a couple of lessons of “walk” and “whoa,” when you need no longer signal with whip or tape to get the desired response, add trot, playing the tape out further so that the diameter of the circle will not stress as yet undeveloped tendons, ligaments, and joints. This is done without drama, the horse appears to be, and is continuously comfortable. And although the footman may perspire, the horse should not sweat. Several lessons from now, add canter. Important is that no matter how you pronounce the word you choose for each command, that the intonation of “trot” be the same each time you ask for trot, and the intonation of “caaan-te” be the same each time you ask for canter. Ditto for “whoa” and “walk.” And equally important is that the intonation of each command be distinctly different from each other command. As soon as you can “walk” and “whoa” on voice commands on the longe, and being certain that your horse’s high spirits and excess energies were expelled in the pasture or paddock beforehand, you can mount and walk and whoa on voice commands, with loose reins and passive legs. 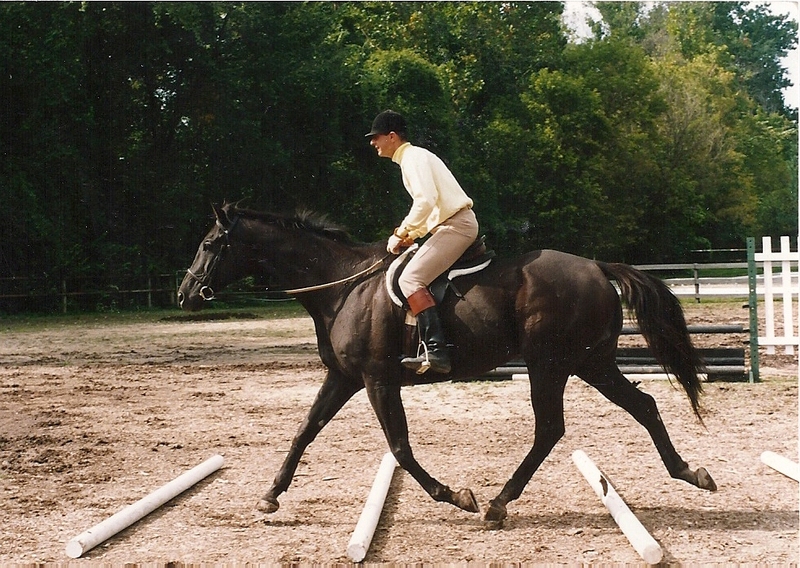 When “trot” is solidly built into the horse’s vocabulary, you can ask it to trot from the saddle, with firm resolve to use neither hand nor leg. It may take a month or so, but eventually you will canter the same way, and ride everywhere, nonchalantly, on loose reins. You will be pleased to realize that riding on loose reins builds your confidence in your horse, the horse’s confidence in you, the horse’s confidence in himself, and your confidence in your own riding ability. Knowing that you can rely on the horse to respond to your voice will improve your tact in applying hand and leg influences. Why is this Well, the answer is that videos are just a great deal easier to follow than instructions. Hi, Sydney. And thanks for opening this topic. It seems we each have a personal learning style, and style of receptivity to learning facilitations changes as we mature. Although our horses are our only teachers, our learning is facilitated by hearing and reading instructions, observing real life as it unfolds for us, and seeing videos we may select more-or less-discriminately. All of those medium must be filtered…only our horses give us valid, unbiased feedback. Horses NEVER lie. Horses are far more noble beasts. Whoa! I am so glad to find this website. This article is about exactly what we do with our four year-olds, and it gives us a better way to think about them and the training we give them. Hello There. I found your blog using msn. This is a really well written article. It causes me to consider the foundation of my horse’s training, and whether I should take time to ride on loose reins more often. Thanks for the post. I’ll definitely comeback. I am so happy to find this website. By translation, I got what you think. Thanks for sharing this explanation of Stabilization. Andy, all of the articles in DressageUnderground are written or curated by Christopher Hyams. I am glad that you are finding instruction relevant to your own practice here. This is clearly the way for any rider who wants to improve understanding and technique in this basic theme. Your references are so expansive that it is impossible to debate with you (not that I truly would want…HaHa). You definitely put a new twist on a topic that has been practiced virtually forever. Good blog, just capital! Jeremy, an American Horseman President, is noted to have said, when then Governor of New York State, “Walk softly and carry a big stick”. He was not talking about stabilizing horses, but, well, that’s how it works. ps…Others quote Teddy Roosevelt as having said “Speak softly…” which is equally poignant.